Emmanuel’s music is an essential part of its worship. The repertoire of the adult choir is varied, with its foundation in classical sacred music from many periods. Hymns are carefully chosen to fit the lectionary, and the congregation sings over 250 hymns during the church year. Regular full-choir anthems are supplemented by small ensembles and soloist on occasion. On Christmas Eve, the choir participates in a traditional Lessons & Carols Service, based on the one given at Kings College in Cambridge, England. The choir continues it's tradition of chanting the "Great Litany" in procession on the First Sunday of Lent. 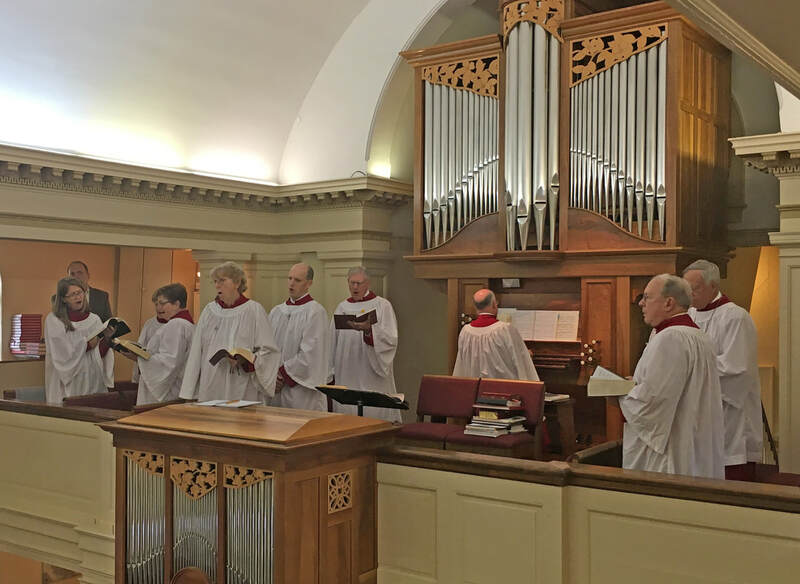 On Ascension Day, the choir joins the choirs of St. Paul's Ivy and Christ Church, Charlottesville in Choral Evensong for Ascension, continuing a tradition started during our 150th celebration. 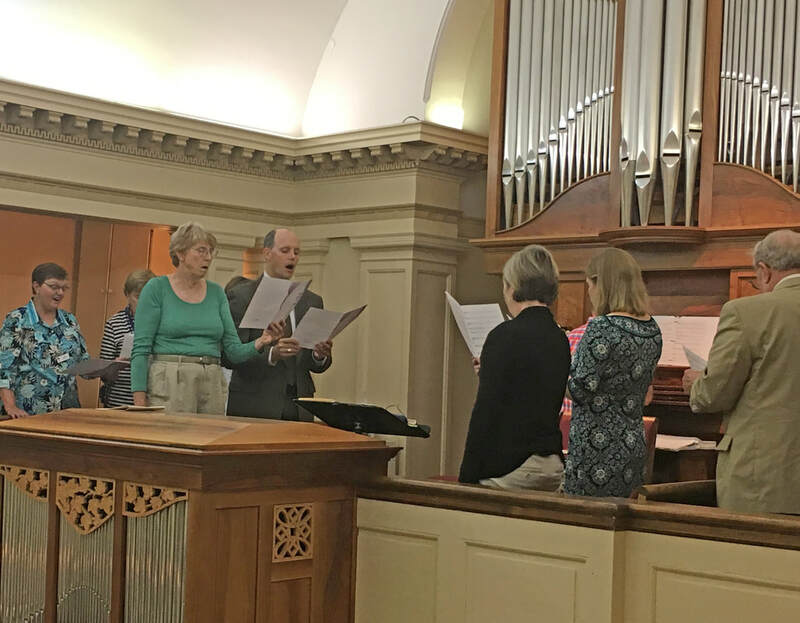 From September to May, the Adult Choir practices Wednesday evenings at 7 p.m. in preparation for Sunday Services and does not require an audition. 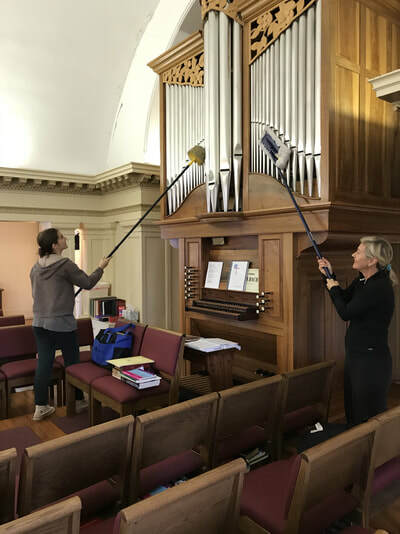 During the summer the choir rehearses just on Sunday at 9 a.m.
For more information, please contact Larry Smith, Music Director, or contact the church office at 540-456-6334. In 1998 Emmanuel commissioned a new organ from Richard Howell of Lynchburg, VA. 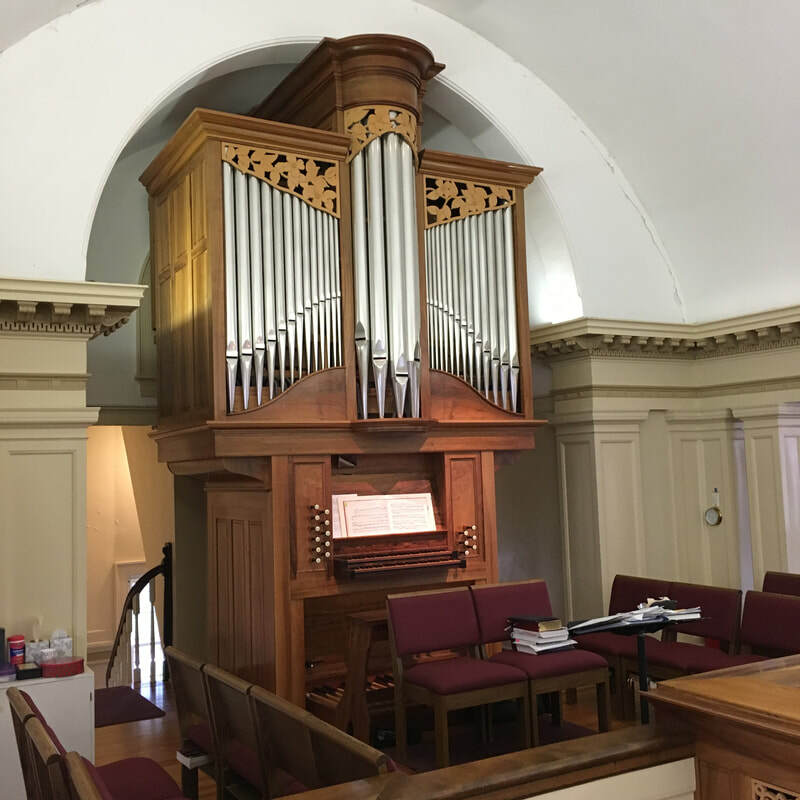 The instrument was installed and dedicated in 2005. Emmanuel is indebted to the estate of Pat Stewart whose bequest helped make this possible. The casework is made of French walnut with the rough sawn boards from each log kept together as a set. Both the main case and the chaire case employ extensive mortise and tenon joinery. The carved pipe shades and the two Celtic panels are of Pacific natural color yellow cedar. The front pipes are of seventy-five percent tin, with sheen and color produced by chalk. The organ has sixteen speaking stops, comprising 1,088 pipes, disposed over two manuals and pedal. Among the pipework are several different forms and materials: cylindrical and tapered pipes; stopped pipes (having their upper ends closed); half-stopped pipes, in which the closed upper ends are pierced and fitted with additional resonators referred to as chimneys; flue pipes (the majority, with no moving parts), and reed pipes (in which a metal flapper or “tongue” vibrates). The end result is an instrument of considerable potential. 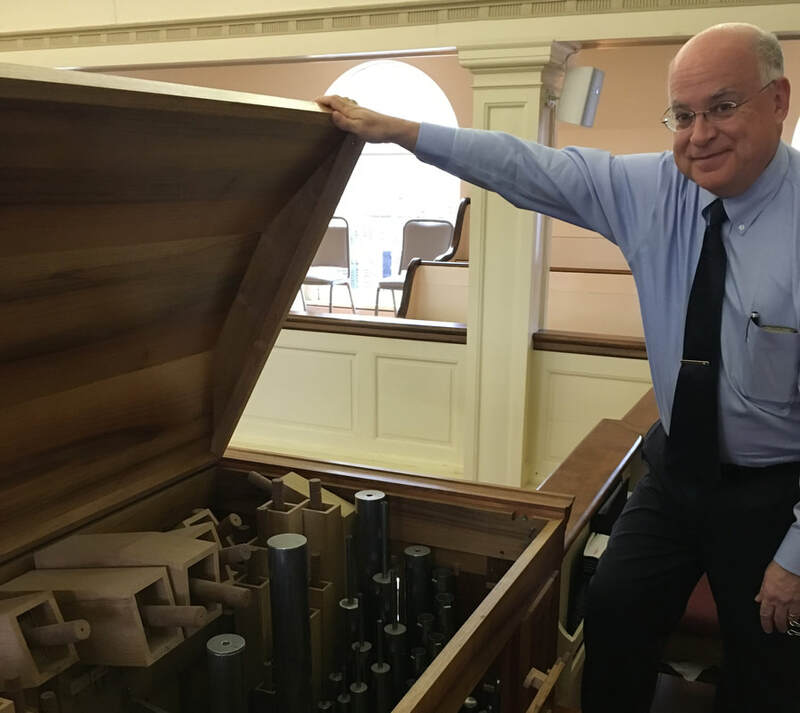 It can support congregational singing and be played with other instruments. 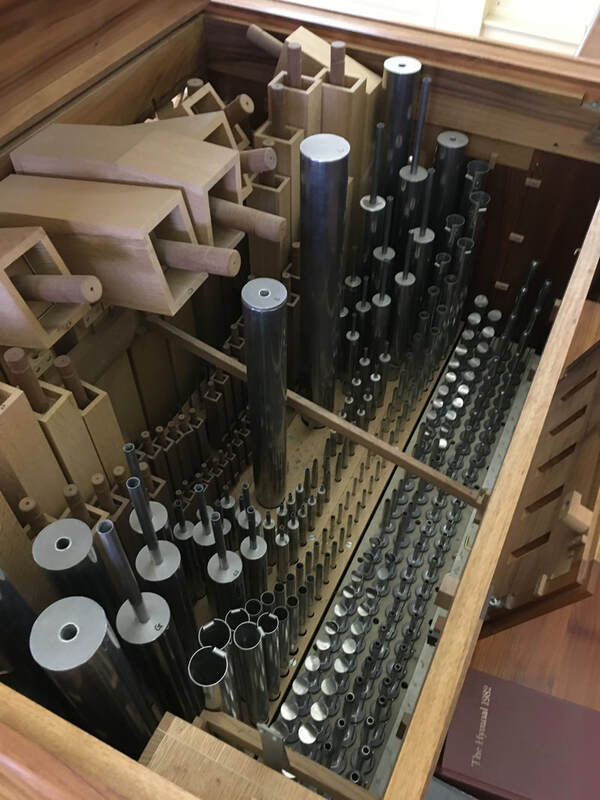 Its relatively small size notwithstanding, it can do justice to a large proportion of music written specifically for the organ: a repertoire which, accumulated in many different periods and regional styles, forms one of the most enormous for any single instrument.